Y’all. 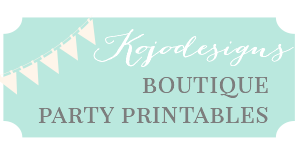 It’s been forever since I put together a post, and even longer since I did a full kojo party. But last weekend we hosted the most epic of all the Harry Potter parties and it must (MUST!) be shared. I will be honest- putting this party together was a little like plunging back in to a thrashing ocean when you haven’t been swimming in a few years. But both kids wanted to pool their birthday celebrations for one big party. And did I mention Harry Potter and how much I love a good theme? I plan on sharing all the Gryffindor-and-Ravenclaw-ish, Honeydukes-extraordinaire, we-even-made-a-joke-shop (and a whole fleet of flying snitches!) details in the weeks (months?) 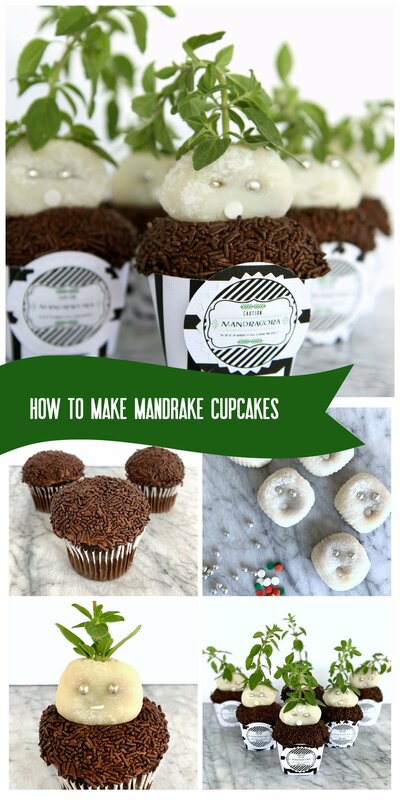 to come, but I’m starting this Harry Potter party extravaganza off with the mandrake cupcakes. 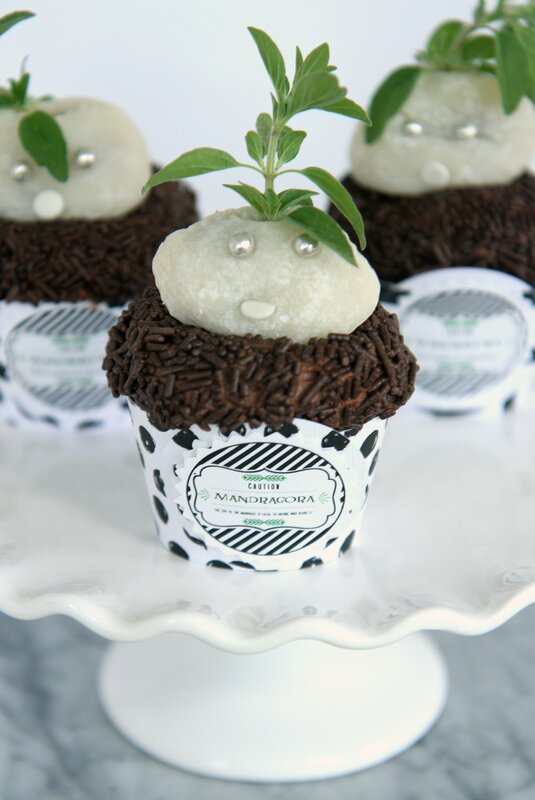 These cupcakes were totally one of my favorite parts of the kids’ Harry Potter Party. Not low maintenance, but SO FUN. And definitely worth making! Make chocolate cupcakes. 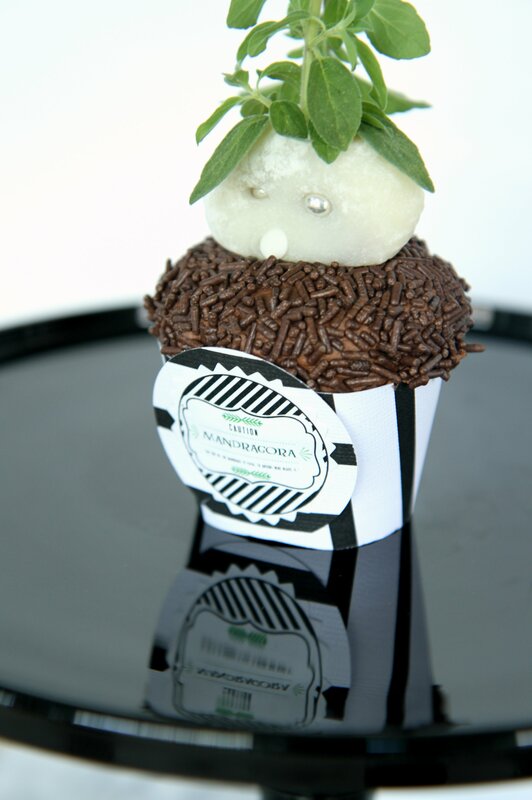 Add a thick dome of whipped chocolate frosting and cover with chocolate sprinkles (I portion out the sprinkles into a shallow bowl and then roll the top of the frosted cupcake in them until they’re covered). 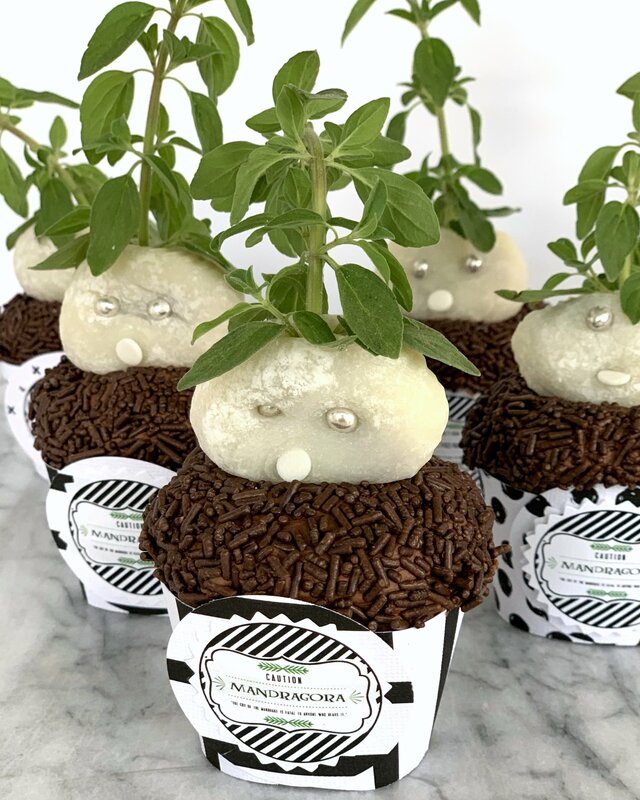 Make the mandrake faces by adding sprinkle ‘eyes’ and a sprinkle ‘mouth’ to white mochi (I ordered these mochi on Amazon, but you can also find them at Asian grocery stores or markets). 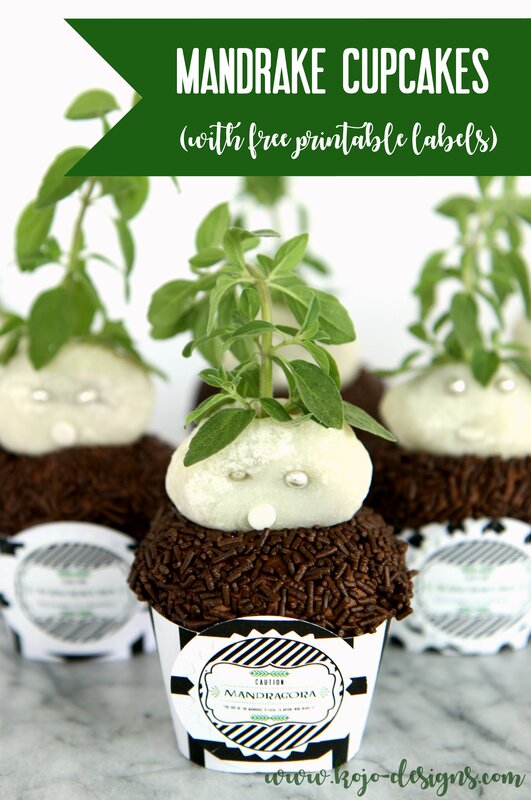 Add a sprig of an herb to the top of the mandrake face (we used oregano, but I think mint or parsley would also work great!). 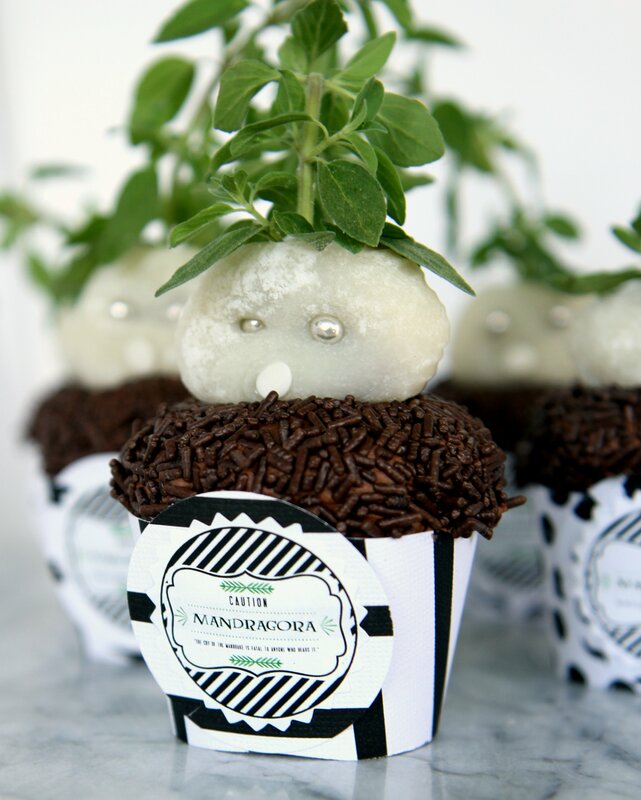 Add a Mandragora label and cupcake wrapper (free printable mandrake cupcake labels HERE). 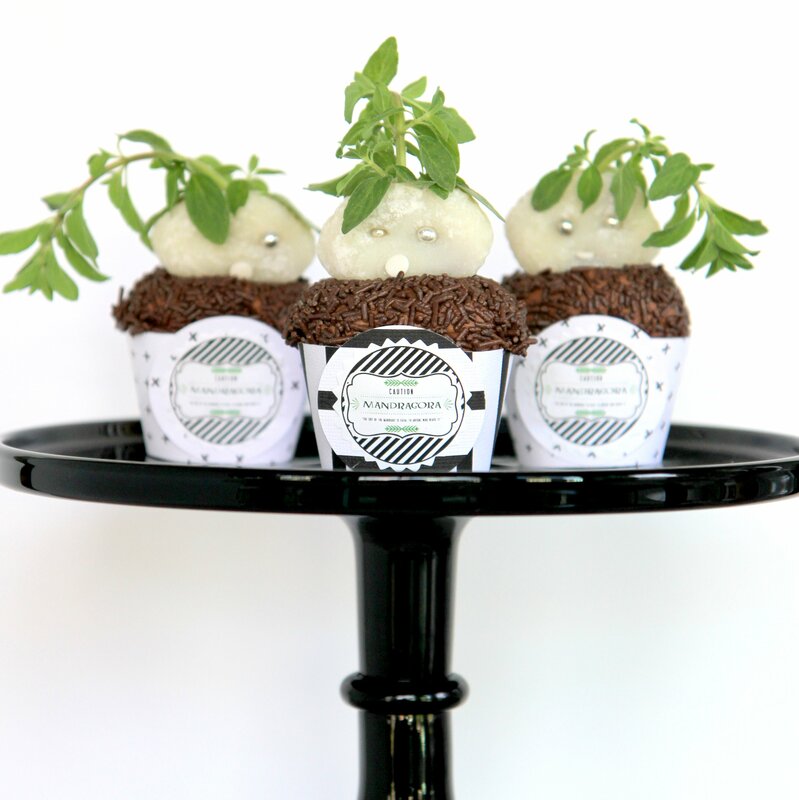 And you’re done with Mandrake Cupcakes. They aren’t exactly cute, but mandrakes aren’t exactly cute either and these are SO FUN, right? 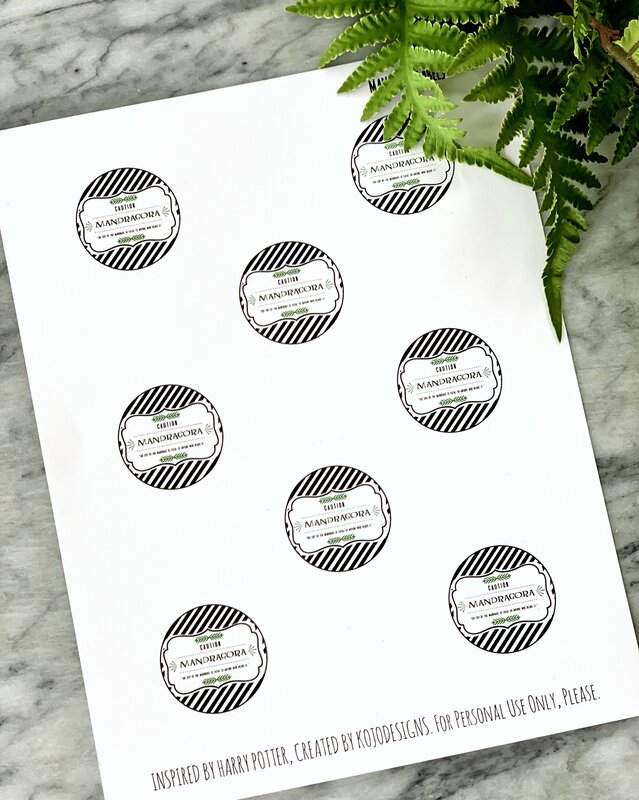 And they’re perfect for any Harry Potter party or celebration!